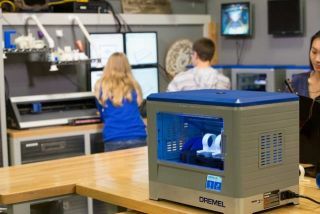 Dremel introduces its second-generation Dremel Idea Builder 3D40 printer to support 3D printing in STEM instruction. Advancements include USB- and WiFi-enabled printing, active filament monitoring, a maintenance-free extruder and assisted leveling. A larger building platform enables greater flexibility in designing and scaling 3D models. To provide students the freedom to design 3D objects remotely, the Dremel Idea Builder 3D40 will be compatible with the new Dremel 3D iOS and Android apps launching in May. The printer can also be used with Print Studio software, enabling students to optimize object design and make modifications based upon functionality. The Dremel Idea Builder 3D40 is scheduled for full availability in June, with pre-orders available now. To learn more about the printer, visit https://3dprinter.dremel.com/3d40-edu-printer-benefits.